Let’s usher December in with a treat that’s common this time of year….fudge. With the conventional fudge recipes being over the top sweet, I never liked it much. Anyone else feel that way? This is a milder sweet fudge with incredible flavor without being grossly sweet. It’s made with great stuff and in only a few minutes. 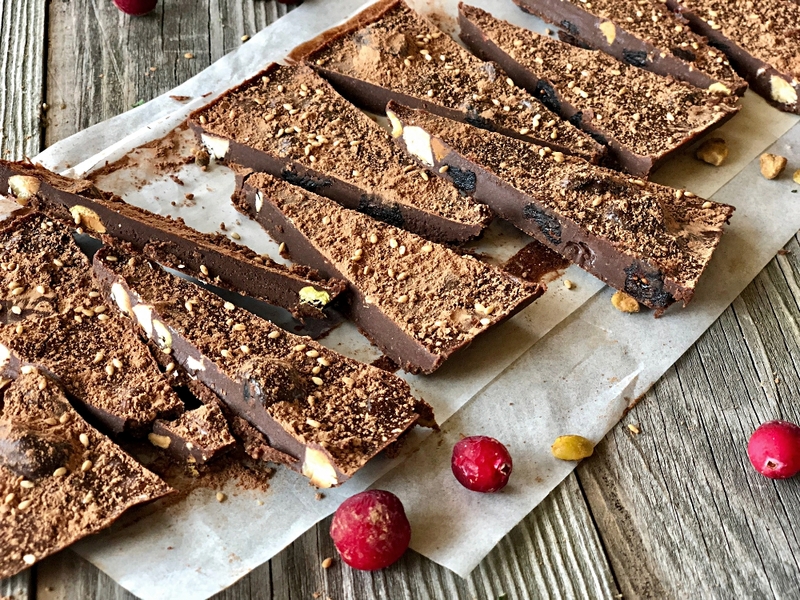 Chocolate Pistachio & Cranberry Fudge is a confection that will be devoured at any holiday party you take it to, but because it doesn’t compromise on flavor – no one will know it’s made with quality ingredients. 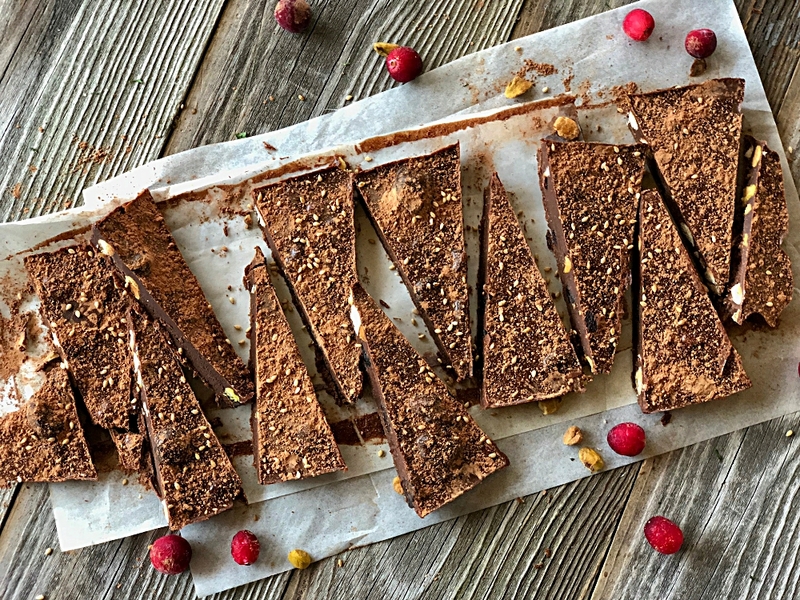 Chocolate is best with the added crunch of nuts and in this case pistachios and almonds. As a kid, (obviously before I changed my eating habits 🙂 I grew up eating a lot of Hershey almond bars because my dad was a distributor for the company. Early on I cultivated a love for nutty chocolate bars. So when I saw this recipe from www.thisrawveganlife.com with this nutty combo-it was a no brainer. I however adapted it slightly. I used lightly roasted the almonds (coarsely chopped) and pistachio’s, but feel free to make it your own by using different fruit and nut combo’s. No need to fire up your oven for this recipe. It’s not really fussy and involved like baking Christmas cookies. It’s much easier and done in no time at all. It’s the perfect treat to bring to a gathering during this crazy busy season because it’s presentation is gorgeous with little time invested. No worries about bad fats here either. 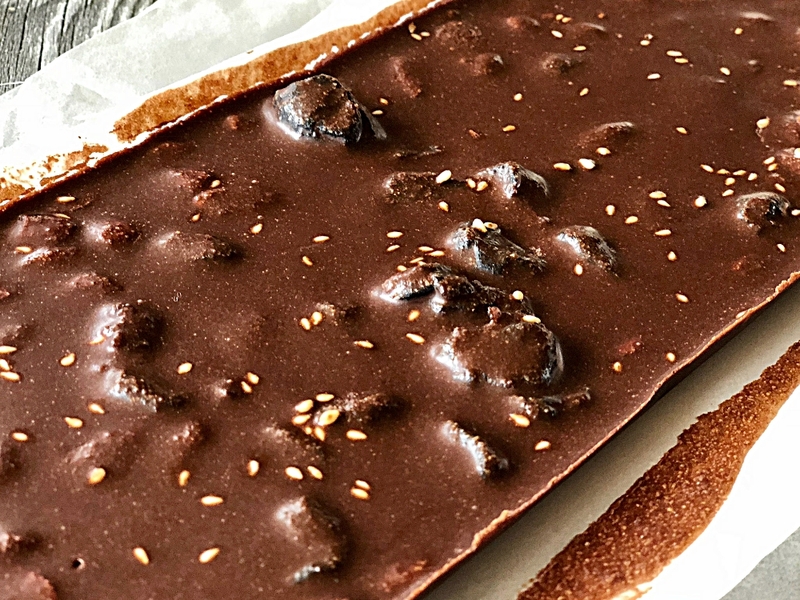 Made with cacao butter, you get all the benefits healthy fats have to offer. Derived from the cacao bean, it’s white, with a rich, fatty texture. It actually looks and tastes a bit like white chocolate. I bought mine at thrive market online, but amazon also has it and you can probably get it at Whole Foods. 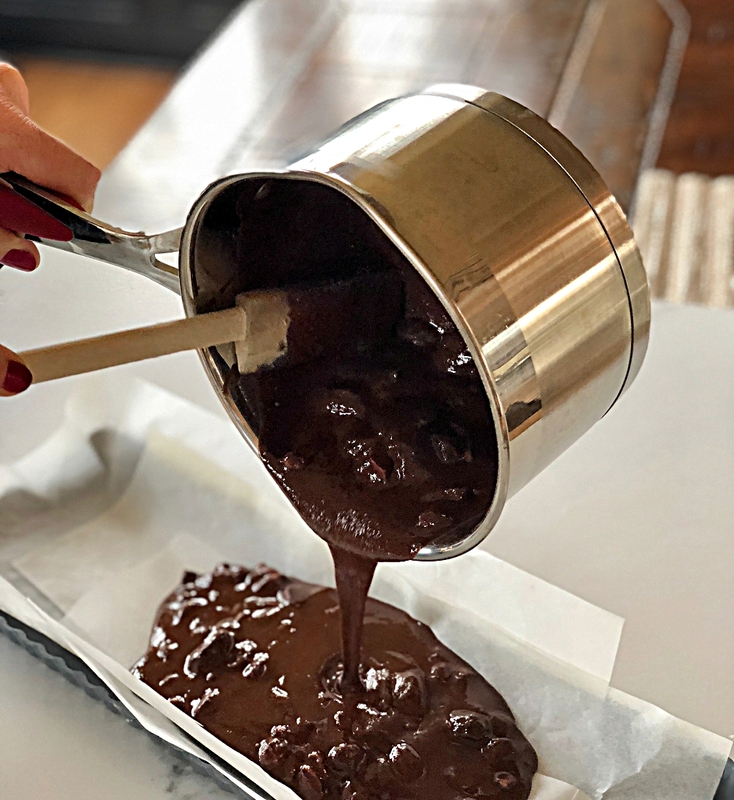 Once all of the ingredients are melted and combined, you can pour it into a lined loaf pan, chocolate molds or I used a 14 x 5 inch fluted pastry pan with a removable base. When poured thin it’s more like bark, but the thicker it’s more like fudge. Either way, it’s so stinkin good! I was very happy to take little packages of this to all my kids homes. I had to remove the temptation or I could have easily eaten the whole thing. Speaking of kids, we all traveled to Nashville after Thanksgiving for an early Christmas celebration at our daughters lovely new home where her and her husband showered us with southern hospitality. 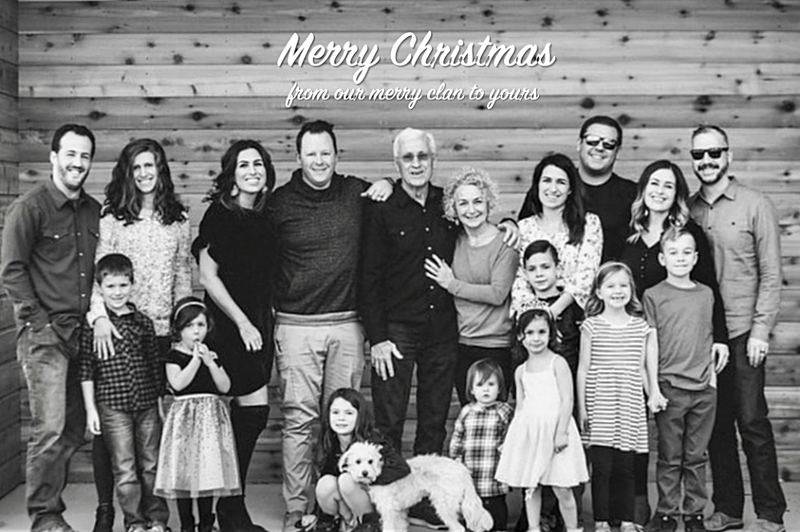 For 5 days we cooked together, had bonfires, hiked and swam (yes, it was unseasonably warm) did a lot of talking, laughing and loving…and we had our annual kids and adult separate Christmas celebrations. We broke in literally every square inch of her new home. Returned with a full heart and a family photo that’s actually pretty decent. With a crew this big, including the cutest little people ever, that’s a miracle. So thankful for our wonderful time together! And yet my heart weighs heavy for some friends and family close to me for whom because of physical or emotional pain this is not a season of joy. Being together as a family is a luxury that I don’t take for granted. I savor this gracious gift and at the same time reach out in heart, prayer and kindness to those who are experiencing a season of struggle. We have been there also but not without love and support. It makes all the difference. So go make some chocolate fudge and love on your people my friends. Grind the coconut sugar into a very fine powder. I used my very small blender that I use for travel, but a coffee grinder works. Melt the coconut oil and cacao butter in a small pot over low heat. Once melted, stir in cacao powder, coconut sugar, vanilla, salt, tahini, and maple syrup. Mix well. Remove from heat and stir in the dried fruit and nuts. Pour into prepared loaf pan or chocolate mold(s). Option to sprinkle with toasted white sesame seeds. Let the fudge harden up in the fridge for a few hours. Sprinkle with a dusting of extra cacao powder. Cut carefully into 16 pieces. Store in an airtight container in the fridge for a week or up to a month in the freezer. Amy, what’s the difference between cacao butter and cocoa butter? Hi Debbie, from what I’ve read, cacao butter is the pure, cold-pressed oil of the cacao bean. Raw cacao butter production is done at a low temperature in order to preserve it’s nutrients, while cocoa butter might undergo more heat during the pressing process. 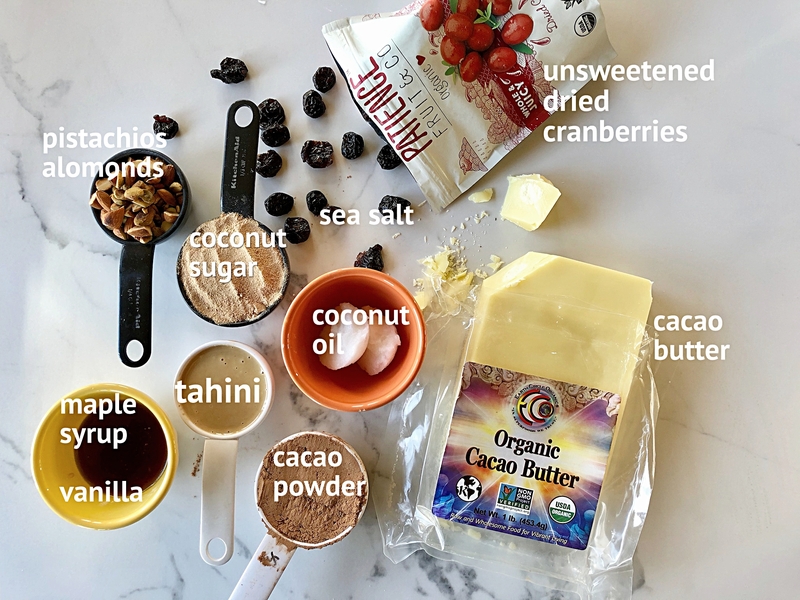 Raw cacao butter is more nutrient dense but otherwise they are totally interchangeable. Both are edible, stable vegetable fats that can be used in cooking. Glad you got to spend time with family. It truly is such a blessing. Hope the rest of your Christmas season is blessed as well. Thanks Jennifer. Miss you girl and Merry Christmas!